You are here: Home / EcoKids-Environment / Hand Up Congo: Send Your Old Cellphones, Honor Gregoire! Children have a way of connecting with animals more than people sometimes, and it’s not often that I have an opportunity to help out both in one media-based nugget to unite the interconnectedness of all. Gregoire, known to many as the ‘star’ of the Animal Planet film, Jane Goodall’s Return to Gombe, and a National Geographic cover boy in 1995, was also the senior statesman for the Jane Goodall Institute’s many kids’ programs including Roots and Shoots and chimpanzee protection from the bushmeat trade. So I say why not combine the two media moments in a tribute to engage kids in primate to primate solidarity to bridge the gap in a ‘twofer’ life lesson of kids’ helping animals and kids helping kids! You use media to pay it forward! The interconnection between living things is priceless as kids learn how to be agents of change themselves. It somehow seems fitting that Gregoire could help kids promote sustainable livelihoods in Africa, even after he’s passed away…so I love this idea of celebrating his life rather than mourning his death. “First, he looked at the blue wrapping topped with pink bougainvillea flowers. Then, very slowly he made a tiny little hole to look through. So celebrate Gregoire’s media life by donating your used media tools to Hand Up Congo…and know that BOTH worthy organizations could use a ‘hand up, not a hand out’ if you feel so inclined. remind kids when their focus turns to animals so instinctively, there are humans of grace and gentle dignity that could use some of that compassion as well! Collect outdated cell phones, PDAs, digital cameras and laptops and ship them — FREE — to the Phone Fund, which will give HandUp Congo cash in return! * Email Phone Fund (be sure HandUp Congo is in the subject line) with the box weight. A bathroom scale works just fine for weighing. * Include your name and mailing address. * You will receive an email linking you to your FedEx shipping labels online. * Print out your labels and affix them to your box(es). * Ship at your convenience and at Phone Fund’s expense! 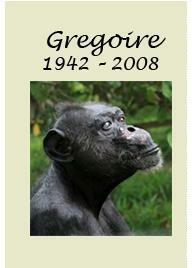 In Memoriam: Gregoire, 1942-2008 from The Jane Goodall Institute on Vimeo. The perfect way to acknowledge Gregoire…probably far more people cared FOR Gregoire than the other primitive George Bush! “Dear Friends, I wanted to write to thank all of you for your expressions of support and condolence after Gregoire’s passing. We received hundreds of very kind and heartfelt messages. Each letter meant so much to me, and to all of us at JGI. It’s wonderful to see how many hearts Gregoire touched. Obviously it would be best if I could write my thanks to each of you personally. Unfortunately that isn’t possible. Please accept this e-communication, then, as an expression of my gratitude and an acknowledgment of the ways in which Gregoire’s story resonates with our desire for a compassionate world. I find that people who care deeply for animals often find creative, life-changing ways to express compassion to human and nonhuman beings alike. The determination of so many to make a better world sustains me during my almost nonstop travels to promote our work. Please know that your steadfast support and good wishes are critical to JGI. You help us build a future in which chimpanzees are thriving in the wild and you help us move orphaned chimpanzees from a bleak and painful existence to one filled with much light and love, just as Gregoire’s life changed for the better in his latter years.